Welcome to the March digital release blog hop!!!! Don't forget to leave comments along the way as there will be 2 mystery DT Members who will each be choosing a winner from the comments left on their hop posts! The hop will run for 1 week and end on Saturday 7th March at 12 Noon EST, when the lucky winners will be announced right here. Here is my card for the March blog hop. 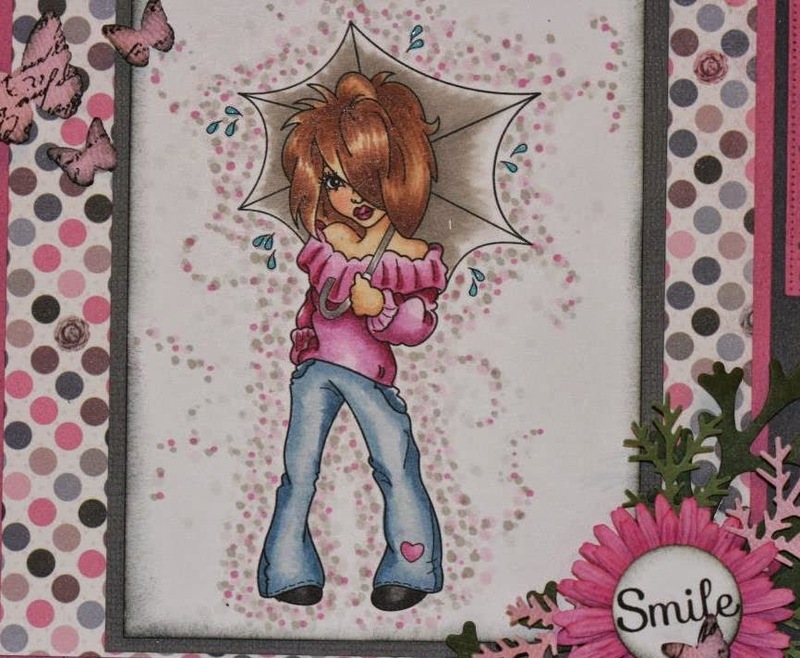 I used this super cute image called Spring Rain created by designer Marika Collins. I also used some great Whimsy Store products : The dies in the corners are Mini Lace Corner Doily Dies, and the sentiment came from a rubber stamp set called Everyday moments. I added the dots around the outside of the image to create a whimsical feel to the image. Thank you for stopping by for the Whimsy blog hop. Such a cute image! Love your papers, and the two corner borders!! Great card and I love the way you fixed up your sentiment with all those branch cuts! Thanks for sharing your sweet card. Lovely card. Such a great sassy image. Great colouring love the halo of dots around the image. Hi, Welcome to my blog. Let me introduce myself. My name is Charlene, I am a wife and a mother. I am passionate about being creative, being inspired and inspiring others. I love making cards, scrapbooking, photography, reading and spending time with my family. Through these mediums I have found a true love, that has given me an avenue that helps me express thoughts, feelings and moments in life I want to embrace. I hope I can help inspire your creativity. Thank-you for stopping by, I hope you drop by again to check out my upcoming projects.